Migrants and ethnic minorities form a growing part of the population of Europe. They often have higher than average exposure to health risks, while facing barriers to accessing appropriate health care. International bodies have called for policy measures to tackle these inequities. COST Action IS0603 (Health and Social Care for Migrants and Minorities in Europe) was a European network of researchers from more than 30 countries, which met between 2007 and 2011 to discuss how to strengthen the knowledge base on migrant and ethnic minority health. 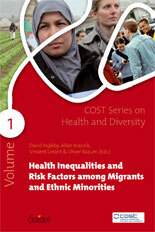 The COST Series on Diversity and Health comprises two volumes written by leading authorities in the field, illustrating the issues that were discussed. This first volume starts by asking how much we know about migrant and ethnic minority health and where the barriers to scientific progress lie. For example, what is the relation between migration, ethnicity and the socioeconomic determinants of health? Particular groups discussed include refugees and asylum seekers, domestic workers, new migrants, ‘mixed marriages’ and disadvantaged ethnic minorities. Specific health issues examined range from maternal and child health to problems of ageing, mental health and infectious diseases. The final section of the book discusses prevention programmes targeting obesity, diabetes, coronary vascular diseases and cancer. These topics form only a small selection of the full range of issues in this rapidly growing field, but they illustrate well the fascinating challenges which it presents. "Whilst the book is informative and thought-provoking to read from cover to cover, or to pick out specific chapters, it is also the kind of book to just dip in and out of to trigger trains of thought and reflection upon ones own area of work within health and social care."